Built with a heavy 1,279-lb. (580-kg) operating weight and high 15,7373-lb. (70-kN) centrifugal force, the heavy-duty BPR 70/70 D reversible plate compactor delivers high compaction performance on small and medium construction sites. The Bomag BPR 70/70 D reversible plate compactor boasts a specially designed comfort handle that reduces vibration feedback to the operator's hands, reducing fatigue. Rubber vibration buffers connecting the steering rod to both the handle and the base plate drop hand-arm-vibration values to 8.2 ft./s2 (2.5 m/s2), offering enhanced operator protection while using the compactor. This comfort handle design is now available on all Bomag medium and large reversible plate models, ranging from the BPR 45/55 D to the BPR 70/70 D.
This large reversible plate features a longer steering rod design that requires less effort to maneuver the compactor during operation. With vibration and throttle controls conveniently located on the steering rod, the BPR 70/70 D's intuitive control concept delivers quick reversal times for increased productivity. The rod is adjustable and locks into operating position to quickly adapt to a wide variety of operator heights for improved comfort. It also locks into vertical position for transport to reduce space requirements on the trailer and prevent damage while moving the compactor from job to job. Built with a heavy 1,279-lb. (580-kg) operating weight and high 15,7373-lb. (70-kN) centrifugal force, the heavy-duty BPR 70/70 D reversible plate compactor delivers high compaction performance on small and medium construction sites. A standard working width of 27.6 in. (70 cm) allows the reversible plate to compact large areas quickly at speeds reaching 91.9 fpm (28 mpm). Available bolt-on extensions increase compaction area to 33.5 in. (85 cm), giving contractors the flexibility to compact at widths ranging from 21.7 to 33.5 in. (55 to 86 cm) to meet site conditions. The BPR 70/70 D can be equipped with the Economizer compaction measurement system that saves contractors time and money by reducing the number of passes. The exclusive acceleration sensor developed by Bomag measures soil stiffness and displays real-time compaction progress on an easy-to-read gauge mounted to the back of the protective hood. As soil stiffness increases, more lights illuminate on the intuitive gauge, alerting the operator to when optimum compaction is achieved. Economizer helps to prevent over compaction and immediately identifies weak areas in the soil, according to the manufacturer. 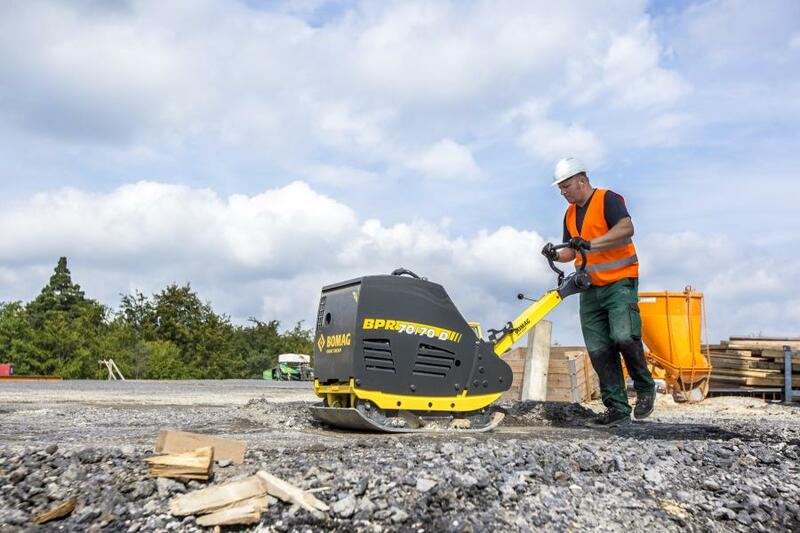 The rugged BPR 70/70 D plate compactor is built to offer contractors years of dependable operation. A hinged hood surrounds the engine and vital plate components to fully protect these areas from damage. The machine's cast-iron base plate delivers high wear resistance for trouble-free operation. The reversible plate compactor is backed by Bomag 3-2-1 warranty.